Today I want you to embrace your inner awesomeness. Today, embrace your inner athlete! This morning, embrace your inner warrior attitude. On this amazing Monday morning moment, embrace your inner champion mindset! It is going to be an amazing week!! May you find the strength to continue to fight for what you believe in. May you find the courage to rise above your circumstances and get your steps in this week! May you find the power to embrace who you are and find the confidence to believe in yourself today. Because you are a Champion! You do not need a New Year’s resolution to make a change and get a new you all you need is a Monday!! 1 Never miss a Monday workout. Monday is like a fresh start. Today is a great day to get some steps in. Today is a great day for you. Today is an amazing day to be alive on this planet earth. Today is a great day to do a random act of kindness. Today is a great day to encourage a co-worker. Today is an amazing opportunity to be your most amazing and authentic self. Do not let anybody else tell you any different! I love Mondays don’t you? Mondays represent a clean slate. 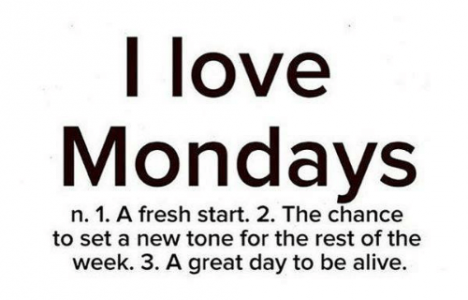 Monday is chance to start over with a brand new day and a chance to start again with new goals and new ambitions. So let’s start off this Monday off strong and start it off right! Show me how awesome you are today by doing awesome things, getting your exercise in, eating healthy and eating right and by being loving to all the people around you! Today is an amazing day to be alive! Today has a really great potential to be a great day! I am excited about the amazing possibilities of how this day might unfold. I am looking forward to having an amazing Monday!